My insights on the “new” Tiger Woods. As I write this article, Tiger Woods has now made his last 3 cuts on the PGA TOUR and has been in serious contention to win two of those events. The golfing world has come alive again with this recent great play! Currently, he has decided to return to competition without an official “coach”. I think this is a very good decision on his part. It is my opinion that a lot of players are becoming overly coached and too technical. He has already learned all he needs to know about the game from a few of the world’s best coaches. He also knows his body better than anyone else and what it is capable of doing and not doing. As a result, he is playing more instinctively and I believe that has also helped his short game to return to a very high level again. I like to coach my students to “become their own coach” so they are able to adjust their game as needed, even mid-round while on the golf course. This ability to self-coach helps prevent further damage to your score during those times when it becomes a struggle. I am only speculating here but my guess is that he is paying some attention to what Phil Mickelson is doing at age 47. Phil recently won and has been playing quite well. His approach seems to be, play more and practice full swings a bit less to prevent injury to the body. Just like Tiger, he already knows how to swing the club. At the PGA TOUR level, you must play with a lot of confidence. The confidence comes from success on the golf course much more than from the practice range. All the more reason for Tiger to play more and practice full swings less. Although it may not be as large a contributing factor, I believe his switch to better golf equipment has had an effect. After Nike left the golf club business, Tiger was free to choose his next equipment deal. He signed with TaylorMade and this allowed him to ditch the Nike putter for the putter he won all but one of his majors with, the Scotty Cameron Newport 2 model. Having a trusted putter like that back in the bag can bring back good memories. If he is to win again, his putting will be the deciding factor. During his post round interviews, Tiger has come close to tears which shows he still cares deeply about the game and the thrill of competition. While it is not known whether he will win again, this recent comeback has been quite remarkable and very inspirational. We will all be very curious to see if Tiger can tame the TPC Potomac at Avenel Farm championship golf course aka: “Beast of the Beltway”. Tiger has now confirmed that he will be playing right here at TPC Potomac in late June for the “National”. Mark your calendars to get a glimpse of golf greatness! After 18 holes and two rain delays, the 2017 Club Car Facility Championship was decided in a playoff at Belle Haven Country Club in Alexandria, Va.
Fran Rhoads and Daniel Neben of TPC Potomac shot a 6-under-66 to force a playoff with Robert Reed and Billy Hoffman, of Westwood Country Club. The TPC Potomac team won on the first playoff hole with a birdie. Neben and Rhoads led the tournament with nine total birdies, while Reed and Hoffman began the tournament with five straight birdies and had only one bogey during play. Correction Golf Swings? Follow what the best players do! Many of my regular students have heard me say: “In golf, there are 3 swings”, then I explain further: “The Practice swing, the Real swing and the Correction swing”. The “Practice swing”: This is your part of your pre-shot routine and I recommend a disciplined practice swing with a purpose and focus. The amount and type of practice swings are an individual preference so that I leave up to the player. The “Real Swing”: Self explanatory, this is your actual swing on the ball and depending on the result you may need the third, “Correction swing”. The “Correction swing”: This is simply a post, poor shot practice swing with the adjustment you felt was needed to make that previous shot better. It might just be a rhythm adjustment such as slowing the swing down or just to improve the balance. Even if you do not know what adjustment to make, do one anyway! Again, only if it is for rhythm or balance. The most important reason to do this is to wash out that last negative swing in both your mind and body so you can attempt your next shot with a clean slate! I always coach my competitive students to try and become their own coach. I do this because in competition, the coach won’t be there and it is up to the player to fix any swing issues as they arise on the course. Good players are able to make swing adjustments at anytime during a round of golf. Even if you do not compete, from putting to driving, the “Correction swing” should be a part of everyone’s game! 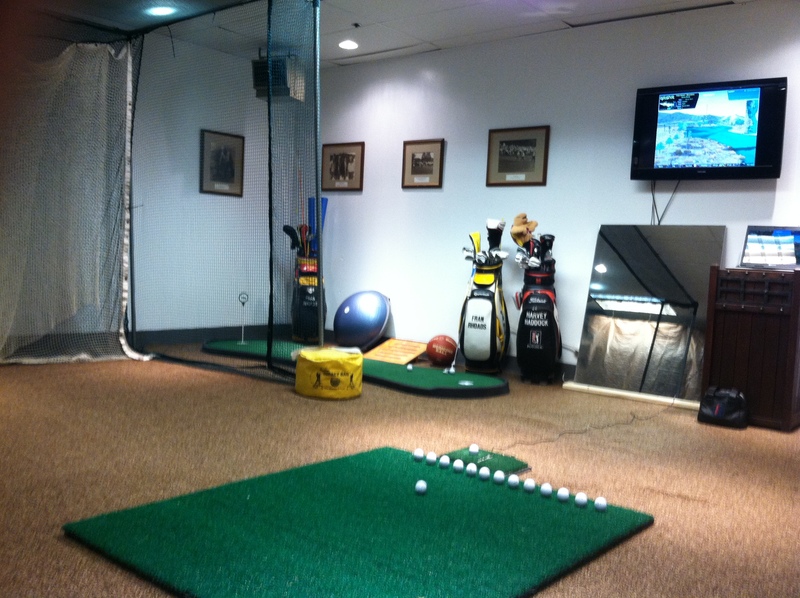 Indoor Golf Training is an investment for summer success. Don’t be an “average Joe”! The game of Golf is hard enough as is. Add to it that most golfers put aside their clubs for several months each year and it is no wonder that many find it difficult to make real lasting progress with their golf games. Year after year, I see the same thing, “average Joe” golfer dusts off his clubs in May when the temperatures are bearable, you know, anything over 65 degrees. Joe then proceeds straight to the full swing practice area and see how the newest driver works, never mind the 15 pounds still hanging on from the Holidays. Joe’s one year older body just doesn’t feel as good as it did last season he soon realizes. After struggling to hit the latest driver, Joe decides that maybe a lesson will help regain the magic and the 10 yards he has lost off the tee. We meet for our lesson and my job is to help “average Joe” improve no matter the circumstances. I am thinking to myself (and I usually end up sharing with Joe) that I wish he would have spent some time with me during the Winter indoor season for training and he would be much more ready for the season. With the indoor training, Joe would likely be 10 yards longer instead of 10 yards shorter off the tee. At the very least, he would be able to maintain the distance he had from last summer and maybe even look better in his new golf outfits! 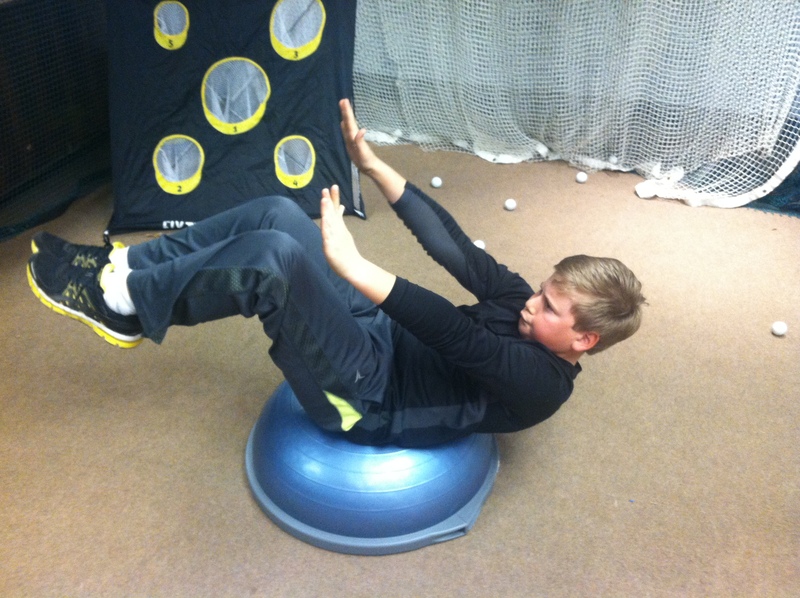 Core strength and balance = better golfers! Not everyone is “average Joe” of course and it is very refreshing to see the enthusiasm many of us share in trying to find ways to improve our games all year round. I do realize that golf is not a passion for everyone. For many, playing recreational golf is the only goal. Even still, there is much that can be accomplished for the recreational golfer in just a few minutes a day indoors. Trust me, recreational golf will be a lot more fun when it doesn’t hurt to swing and you play better! If you do not want to be “average Joe”, then follow my simple advice! Play more golf in the cold weather. You will learn to love 65 degrees and windy while “average Joe” is complaining about it! 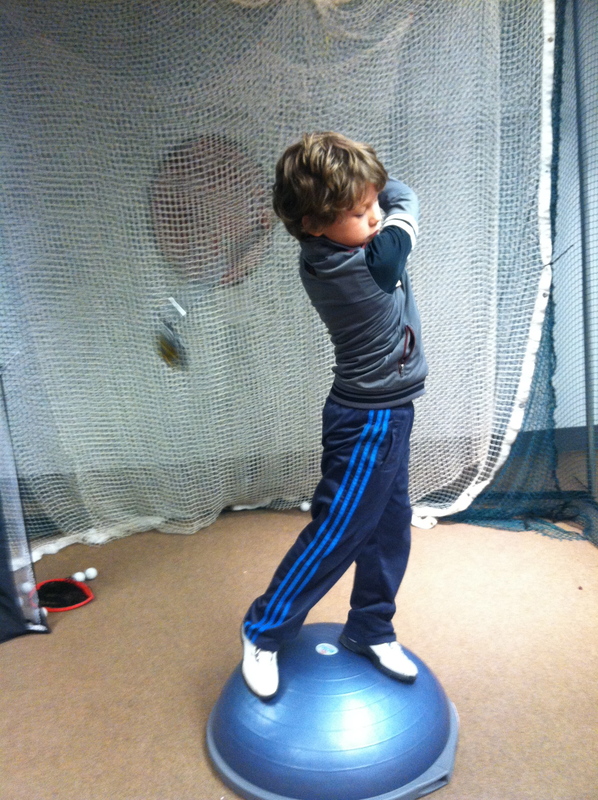 Work on your golf specific and overall fitness during the indoor season. Develop this program with your trainer and golf coach so the program is in alignment with your goals. As a golf coach who is knowledgable with fitness training, I like to meet or speak with my student’s personal trainer’s (if they have one). This helps ensure that we are all on the same page with what we are trying to achieve. Keep a club in your hand at least a few minutes a day. It could be a putter or wedge or any club really. This helps you maintain a feel for the proper grip and overall feel of the club. If outdoor golf is not possible, train at an indoor facility to maintain and improve swing sequence, coordination, balance and power. This is done best under the watchful eye of your favorite golf coach. Many of the things I do for my own game and overall health do not require a gym membership. Read on to some of my other posts on how I train for better golf and you will see that I am pretty serious about golf fitness. Even at my age (55), I can still hit the ball quite well and with good distance. This did not happen by chance, it took a lot of dedication and desire to achieve. If you are interested in developing a program custom designed for your goals, call or text me at 301-514-7520 or email me at franrhoads@gmail.com I am available all year-round! Once you have achieved a base fitness level, its time to take it to the next level. If you do not feel ready to challenge yourself, see a professional trainer and they will assist you. Some of the exercises demonstrated here are advanced but remember that I am a PGA Golf Professional who still enjoys competition. My feeling is that if I am going to compete, I must put forth my best effort. Most of the training I do in the gym involves use of my own body weight. I also try to stress balance and core stability so I get the most out of each movement. My weakness is my flexibility which is not uncommon among most men. In general, Women need to work on strength and men on flexibility but all of us need to work on balance and core stability. This is VERY important for playing good golf! 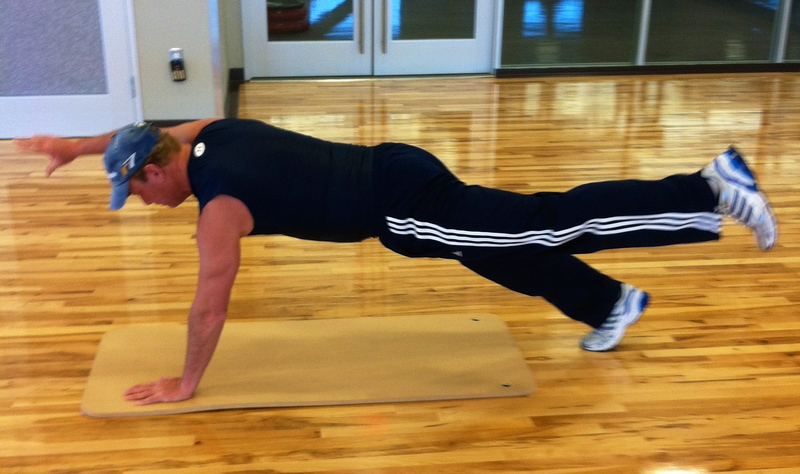 From this “plank” position, reach one arm under and across your body. 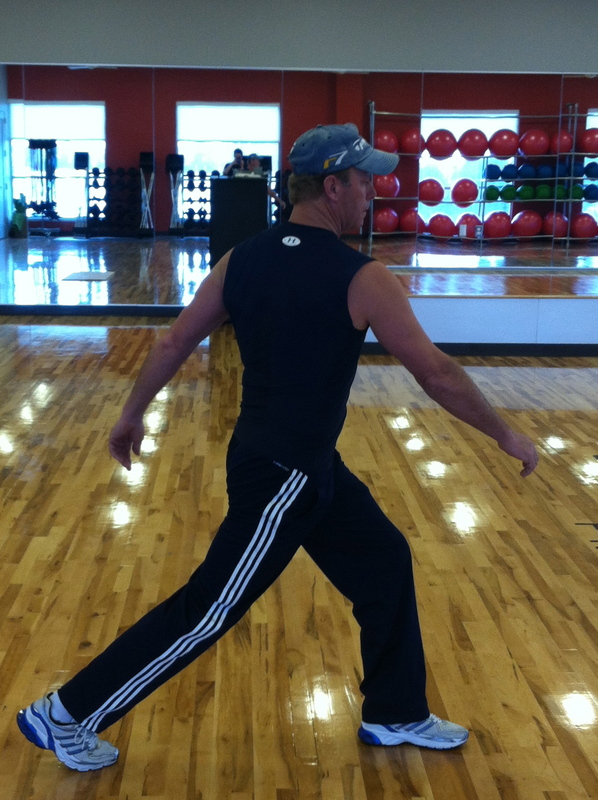 The movement is slow and under control which intensifies the core stability and balance. Slowly rotate and reach up as far as you can while maintaining balance and stability. Repeat until you start to struggle and then start working the other arm. Do equal amounts on both sides. 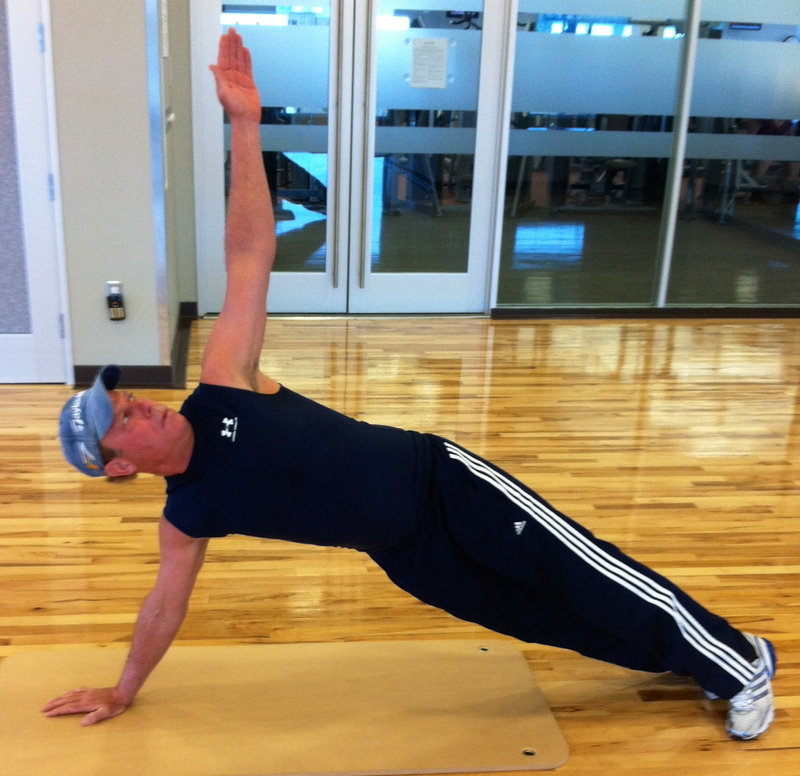 Next is a side plank position, you will find this one to be more difficult but the benefits are amazing. Start as shown with the arm reaching over your head while maintaining your balance. Raise your leg as high as you can and extend your arm at the same time. Try and hold this position for as long as you can. You will feel the tightening of your muscles on both sides of your body. A variation of this is to repeat the motion with only a short hold of the extended position. The motion will look like your body is replicating a large pair of scissors! A great exercise in my opinion. 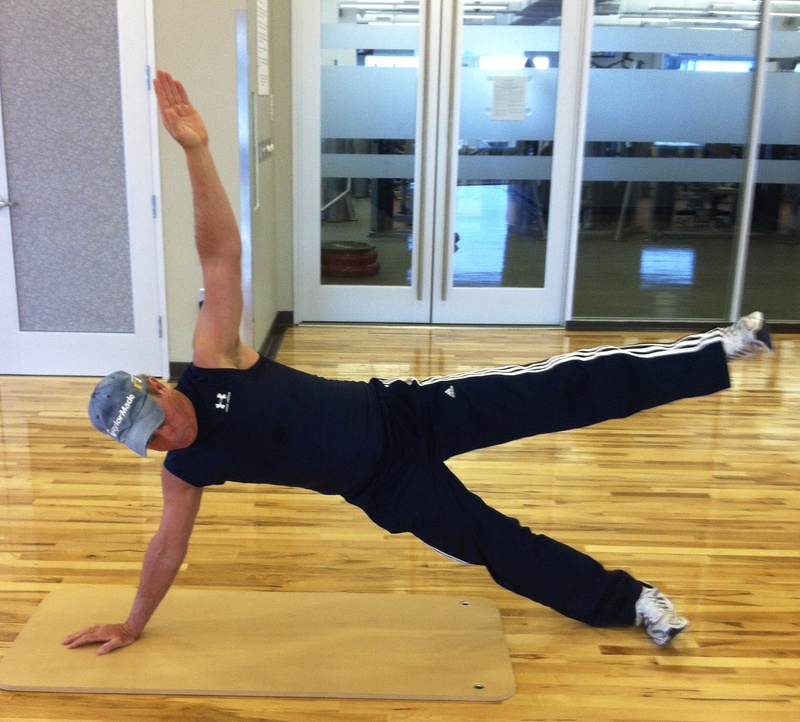 Next is a plank with opposite arm and leg extension as shown. This will strengthen the lower back and entire posterior. Make sure you remain stable and switch to each arm and leg during your repetitions. I have had lower back pain over the years and while its not perfect, I can manage it and this technique is really helping. I try to emphasize balance in every workout I do because Golf (and every day life) requires it. What I am demonstrating here has taken some time to be able to perform. Start slowly on the ground and build your way up to adding in the bosu ball. If you are not at this level, do not use the bosu ball, you risk falling! This is a Yoga position which I am starting to do more of since I need more flexibility. 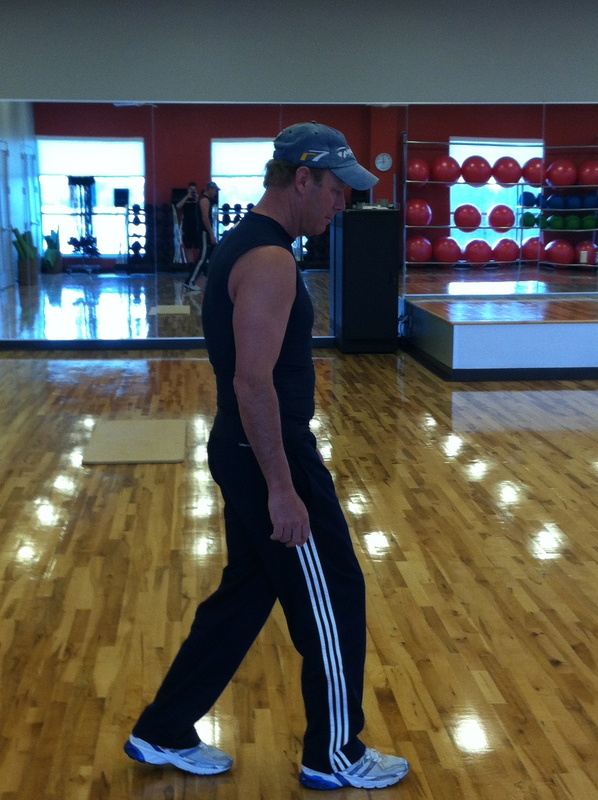 I continue to challenge myself in the gym because I have really experienced the benefits of the training I do. Many of my students and members have told me that they are inspired to do more after seeing what I have accomplished fitness wise. When I hear comments like that, I get even more motivated to continue and set an example for golfers of all levels to do more. I just recently qualified for the Maryland State Open to be held in July. During the qualifying round in which I placed 10th out of over 100 players, I consistently out drove my younger competitors and walked 18 holes without feeling tired at all. I am quite sure this would not have happened without the fitness level I have achieved. It really makes all the time I spend training worth it! Unless you are a PGA TOUR Player or an Olympic Athlete, read on! The golf season is upon us and its time to make sure your equipment is in proper condition. I do not mean your clubs and other gear, I mean the most important piece of golf equipment, your body! While it is great to start your golf season with lessons and time on the practice tee, you will get results much faster if you are in better golf shape. Even if you have not kept in good condition through the season there are a few simple things you can do without going to the gym. 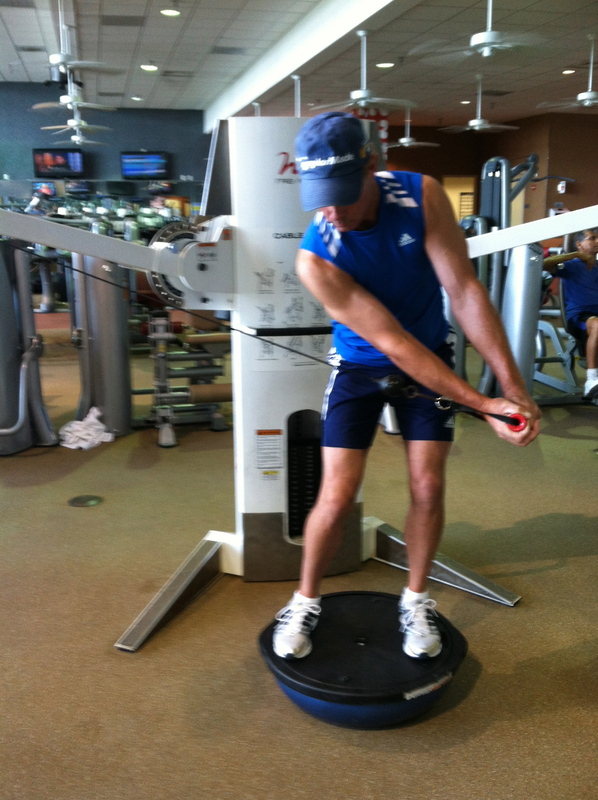 I want to share with you a few things I do to keep my condition golf ready and prevent injury. WALK! That’s right, start a walking program! Something we can all do more of and the benefits are tremendous. Every step you take requires balance, coordination and stamina, all of which are crucial for good golf. Now, I am not talking about taking a leisurely “stroll”, but rather a more intense version as the pictures will demonstrate. I call this my golf walk and while it may appear to be a little exaggerated, it will keep you feeling younger and more fit than if you are just strolling along. First, lets look at how older and less fit people tend to walk. Here I am demonstrating the typical gait of someone out of shape or just not aware of the natural progression our bodies may take as we age. There is no reason to hasten this process so be aware of it and work to improve it. The shoulders and posture are slumped, head down and the stride is short in length. This person will tend to have little or no shoulder movement or swing during each stride. If you are aware of this progression, why not work to improve it!! The first thing you want to do is make sure you are flexible enough to take a longer stride as shown. Also, you want to engage the shoulder and hips by swinging the opposite arm and leg (left foot forward and right arm forward and visa versa). 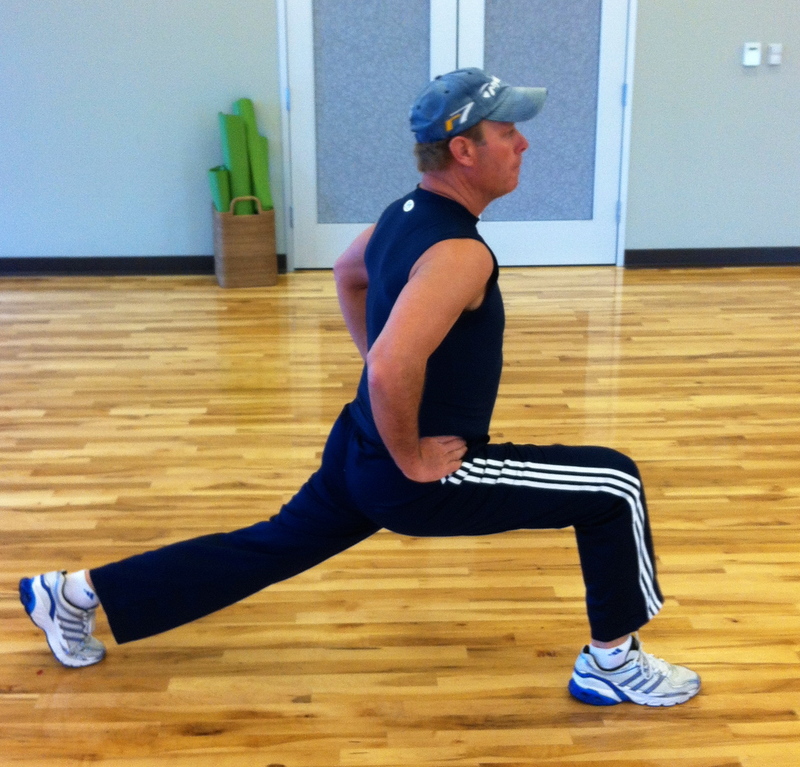 This will stretch the hips and shoulders as they move in opposing direction. 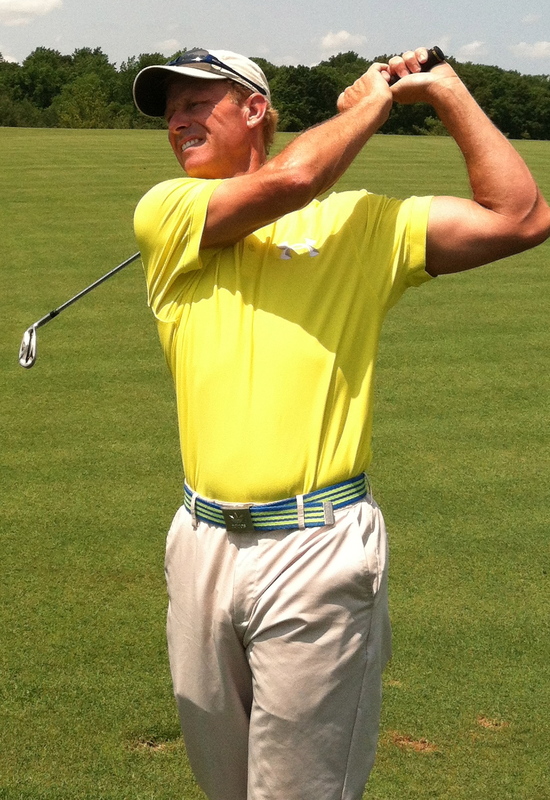 This separation is very important in making a golf swing and is a great pre-round warm up. Start slowly with this motion until you get the coordination perfected and then you can step up the pace. A more advanced version of this would be “lunge” walking but it can be little tough on the knees and requires more strength and flexibility. 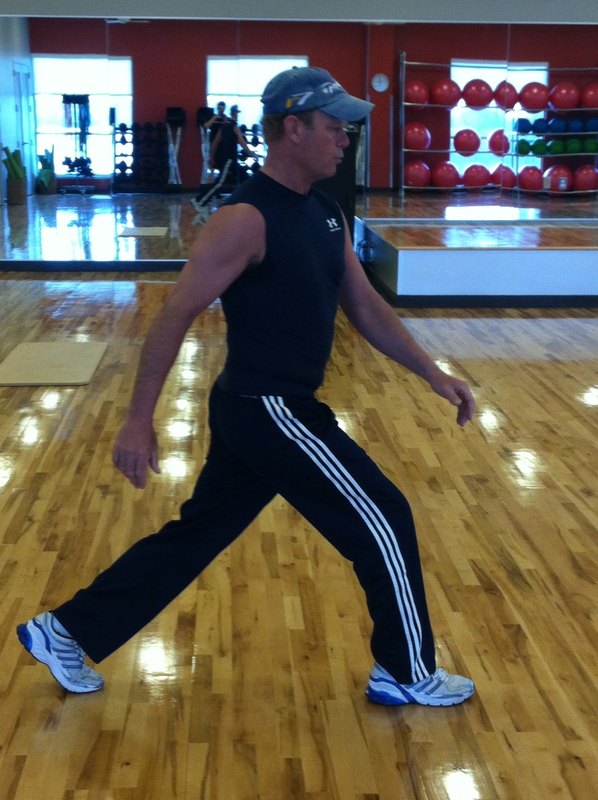 Do not try the lunge walk unless you are fit enough or with a personal trainer. I have done a lot of training and put the time in the gym so I am able to do more advanced techniques. Most all of the training I do now involves using my own body weight. My next blog post will demonstrate training moves I do to keep the power and body control at a high level for the more competitive golfer. Most of us have already heard of the new rule regarding “Anchored Putting”. Just to be clear, the long or belly putter will not be banned, just the ability to anchor it to a fixed point on your body or use your forearm as an anchor point against your body. The purpose of which is to stabilize on end of the putter so the putter head can swing more consistently. In making a stroke, the player must not anchor the club, either “directly” or by use of an “anchor point.”Note 1: The club is anchored “directly” when the player intentionally holds the club or a gripping hand in contact with any part of his body, except that the player may hold the club or a gripping hand against a hand or forearm.Note 2: An “anchor point” exists when the player intentionally holds a forearm in contact with any part of his body to establish a gripping hand as a stable point around which the other hand may swing the club. This is a rather huge ruling for those affected by it, Keegan Bradley, Webb Simpson, Ernie Els, Bernhard Langer etc. but it gives them plenty of time to make the transition back to conventional putting. In my opinion, that is more than enough time to change. In fact, the way these guys work on their games, I am sure they would be just fine in a few weeks or months. For many though, it is not the physical side of it that would be the hardest. The mental crutch would be yanked out from under them as well and that would mean having to deal with the demons of the short putter past. Putting is the most important part of the game at this level and really is the determining factor in who wins and strikes it rich and those that will struggle to keep their job on tour. It is no fun when the hands start shaking and the putter starts to have a mind of its own, trust me, I have been there even at the level I compete. I did experiment a few months on and off with a “Belly Length” putter and will admit that it helped my short putting. Another words, the short length “tap ins” were much easier and less chance of a nervous yip causing a miss. On the other hand, my long distance or lag putting suffered a lack of “feel”. This was particularly true on breaking putts even at medium range. To me it became a net no gain as I made less long putts but made more short ones. In fact, the game was quite boring to simply two-putt most every hole. Two-putting a lot does not get the job done anyway at most levels, you have to do better than that! I have already committed to playing the rest of my days with the short putter even if it means dealing with the yips head on. I do feel that I can make more of the “feel” putts more often and if it means a few more one-putts and a few more three-putts, I think it will make for a more interesting round of golf than steady, boring two-putts all the way. A little more about the word we use so often, “Feel”, which is an intangible, hard to train and hard to teach part of the game. Some believe it is a natural gift, some believe it is attained and some like me, believe it is a combination of both. For me, the belly putter reduced my feel and feedback from a struck putt. With the short putter, I can usually feel right away when a putt is struck if it has a good chance or not to be close or go into the cup. I do wonder if not for 3 of the last 5 Major Champions winning using anchored putters if the ruling bodies would have minded as much?? Maybe they still would have made the change but for the average golfer not on tour or those with neurological issues or a bad back why take it from them?? I believe some exception will be made for non competing amateurs who just play for fun. And if you are playing for “fun” then you can certainly make your own rules as so many already do!! franrhoadsgolf on Competition is still Fun! Jill Cody on Competition is still Fun! Mark Hughes on Competition is still Fun!